Osteopathic medicine is a branch of the medical profession in the United States. Osteopathic doctors (DOs) can be licensed to practice medicine and surgery in all 50 states and are recognized to varying degrees in 65 other countries. Frontier physician Andrew Taylor Still founded the profession as a rejection of the prevailing system of medical thought of the 19th century. Still's techniques relied on manipulation of joints and bones, to diagnose and treat illness, and he called his practices "osteopathy." By the middle of the 20th century, the profession had moved closer to mainstream medicine, adopting modern public health and biomedical principles. American "osteopaths" became "osteopathic medical doctors", ultimately achieving full practice rights as medical doctors in all 50 states, including serving in the United States Armed Forces as physicians. In modern medicine, any distinction between the MD and the DO professions has eroded steadily. Diminishing numbers of DO graduates enter primary care fields, fewer use osteopathic manipulative treatment (OMT), and increasing numbers of osteopathic graduates choose to train in non-osteopathic residency programs. An osteopathic physician (DO) is a fully licensed, patient-centered physician. DO has full medical practice rights throughout the United States and in 44 countries abroad. In the 21st century, the training of osteopathic physicians in the United States is equivalent to the training of Doctors of Medicine (MDs). Osteopathic physicians attend four years of medical school followed by an internship and a minimum two years of residency. They use all conventional methods of diagnosis and treatment. Though still trained in OMT, the modern derivative of Still's techniques, they work in all specialties of medicine. Discussions about the future of modern medicine frequently debate the utility of maintaining separate, distinct pathways for educating physicians in the United States. Physicians and surgeons who graduate from osteopathic medical schools are known as osteopathic physicians or osteopathic medical doctors. Upon graduation, they are conferred a professional doctorate, the Doctor of Osteopathic Medicine (DO). Osteopathic curricula in other countries differ from those in the United States. European-trained practitioners of osteopathic manipulative techniques are referred to as "osteopaths": their scope of practice excludes most medical therapies and relies more on osteopathic manipulative medicine and alternative medical modalities. While it was once common for DO graduates in the United States to refer to themselves as "osteopaths", this term is now considered archaic, and those holding the Doctor of Osteopathic Medicine degree are commonly referred to as "osteopathic medical physicians". Currently in 2018 there are 35 medical schools that offer DO Degrees in 55 locations across the United States, while there are 141 accredited MD medical schools. In 1960, there were 13,708 physicians who were graduates of the 5 osteopathic medical schools. In 2002, there were 49,210 physicians from 19 osteopathic medical schools. Between 1980 and 2005, the number of osteopathic graduates per year increased over 250 percent from about 1,000 to 2,800. This number is expected to approach 5,000 by 2015. In 2016, there were 33 colleges of osteopathic medicine in 48 locations, in 31 states. One in four medical students in the United States is enrolled in an osteopathic medical school. As of 2018, there are more than 145,000 osteopathic medical physicians (DOs) and osteopathic medical students in the United States. Osteopathic physicians are not evenly distributed in the United States. States with the highest concentration of osteopathic medical physicians are Oklahoma, Iowa, and Michigan where osteopathic medical physicians comprise 17-20% of the total physician workforce. The state with the greatest number of osteopathic medical physicians is Pennsylvania, with 8,536 DOs in active practice in 2018. The states with the lowest concentrations of DOs are Washington, DC, North Dakota and Vermont where only 1–3% of physicians have an osteopathic medical degree. Public awareness of osteopathic medicine likewise varies widely in different regions. People living in the midwest states are the most likely to be familiar with osteopathic medicine. In the Northeastern United States, osteopathic medical physicians provide more than one third of general and family medicine patient visits. Between 2010 and 2015 twelve states experienced greater than 50% growth in the number of DOs—Virginia, South Carolina, Utah, Tennessee, North Dakota, Kentucky, South Dakota, Wyoming, Oregon, North Carolina, Minnesota, Washington. A physician demonstrates an OMT technique to medical students at an osteopathic medical school. The body is a unit; a person is a unit of body, mind, and spirit. Contemporary osteopathic physicians practice evidence-based medicine, indistinguishable from their MD colleagues. There are different opinions on the significance of these principles. Some note that the osteopathic medical philosophy is akin to the tenets of holistic medicine, suggestive of a kind of social movement within the field of medicine, one that promotes a more patient-centered, holistic approach to medicine, and emphasizes the role of the primary care physician within the health care system. Others point out that there is nothing in the principles that would distinguish DO from MD training in any fundamental way. One study, published in The Journal of the American Osteopathic Association found a majority of MD medical school administrators and faculty saw nothing objectionable in the core principles listed above, and some endorse them generally as broad medical principles. Frontier physician Andrew Taylor Still, MD, DO, founded the American School of Osteopathy (now the A.T. Still University-Kirksville (Mo.) College of Osteopathic Medicine) in Kirksville, Missouri in 1892 as a radical protest against the turn-of-the-century medical system. A.T. Still believed that the conventional medical system lacked credible efficacy, was morally corrupt, and treated effects rather than causes of disease. He founded osteopathic medicine in rural Missouri at a time when medications, surgery, and other traditional therapeutic regimens often caused more harm than good. Some of the medicines commonly given to patients during this time were arsenic, castor oil, whiskey, and opium. In addition, unsanitary surgical practices often resulted in more deaths than cures. Dr. Still intended his new system of medicine to be a reformation of the existing 19th-century medical practices. He imagined that someday "rational medical therapy" would consist of manipulation of the musculoskeletal system, surgery, and very sparingly used drugs. 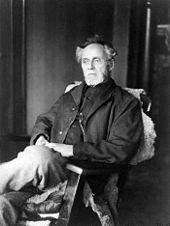 He invented the name "osteopathy" by blending two Greek roots osteon- for bone and -pathos for suffering in order to communicate his theory that disease and physiologic dysfunction were etiologically grounded in a disordered musculoskeletal system. Thus, by diagnosing and treating the musculoskeletal system, he believed that physicians could treat a variety of diseases and spare patients the negative side-effects of drugs. Mark Twain was a vocal supporter of the early osteopathic movement. The new profession faced stiff opposition from the medical establishment at the time. The relationship of the osteopathic and medical professions was often "bitterly contentious" and involved "strong efforts" by medical organizations to discredit osteopathic medicine. Throughout the first half of the twentieth century, the policy of the American Medical Association labeled osteopathic medicine as a cult. The AMA code of ethics declared it unethical for a medical physician to voluntarily associate with an osteopath. "To ask a doctor's opinion of osteopathy is equivalent to going to Satan for information about Christianity." 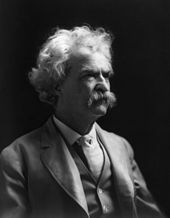 One notable advocate for the fledgling movement was Mark Twain. Manipulative treatments had purportedly alleviated the symptoms of his daughter Jean's epilepsy as well as Twain's own chronic bronchitis. In 1909, he spoke before the New York State Assembly at a hearing regarding the practice of osteopathy in the state." I don't know as I cared much about these osteopaths until I heard you were going to drive them out of the state, but since I heard that I haven't been able to sleep." Philosophically opposed to the American Medical Association's stance that its own type of medical practice was the only legitimate one, he spoke in favor of licensing for osteopaths. Physicians from the New York County Medical Society responded with a vigorous attack on Twain, who retorted with "[t]he physicians think they are moved by regard for the best interests of the public. Isn't there a little touch of self-interest back of it all?" "... The objection is, people are curing people without a license and you are afraid it will bust up business." Recognition by the US federal government was a key goal of the osteopathic medical profession in its effort to establish equivalency with its MD counterparts. Between 1916 and 1966, the profession engaged in a "long and tortuous struggle" for the right to serve as physicians and surgeons in the US Military Medical Corps. On May 3, 1966 Secretary of Defense Robert McNamara authorized the acceptance of osteopathic physicians into all the medical military services on the same basis as MDs. The first osteopathic physician to take the oath of office to serve as a military physician was Harry J. Walter. The acceptance of osteopathic physicians was further solidified in 1996 when Ronald Blanck, DO was appointed to serve as Surgeon General of the Army, the only osteopathic physician to hold the post. In the 1960s in California, the American Medical Association (AMA) spent nearly $8 million to end the practice of osteopathic medicine in the state. In 1962, Proposition 22, a statewide ballot initiative in California, eliminated the practice of osteopathic medicine in the state. The California Medical Association (CMA) issued MD degrees to all DOs in the state of California for a nominal fee. "By attending a short seminar and paying $65, a doctor of osteopathy (DO) could obtain an MD degree; 86 percent of the DOs in the state (out of a total of about 2000) chose to do so." Immediately following, the AMA re-accredited the University of California at Irvine College of Osteopathic Medicine as the University of California, Irvine School of Medicine, an MD medical school. It also placed a ban on issuing physician licenses to DOs moving to California from other states. However, the decision proved to be controversial. In 1974, after protests and lobbying by influential and prominent DOs, the California Supreme Court ruled in Osteopathic Physicians and Surgeons of California v. California Medical Association, that licensing of DOs in that state must be resumed. Four years later, in 1978, the College of Osteopathic Medicine of the Pacific opened in Pomona, and in 1997, Touro University California opened in Vallejo. As of 2012, there were 6,368 DOs practicing in California. Total number of DOs in residency programs, by year. DO residents in AOA (DO) programs. In 1969, the American Medical Association (AMA) approved a measure allowing qualified osteopathic physicians to be full and active members of the Association. The measure also allowed osteopathic physicians to participate in AMA-approved intern and residency programs. However, the American Osteopathic Association rejected this measure, claiming it was an attempt to eliminate the distinctiveness of osteopathic medicine. In 1970, AMA President Dwight L. Wilbur sponsored a measure in the AMA's House of Delegates permitting the AMA Board of Trustees' plan for the merger of DO and MD professions. Today, a majority of osteopathic physicians are trained alongside MDs, in residency programs governed by the ACGME, an independent board of the AMA. In 1993, Barbara Ross-Lee, DO, was appointed to the position of dean of the Ohio University College of Osteopathic Medicine; she was the first African-American woman to serve as the dean of a US medical school. Ross-Lee now is the dean of the NYIT College of Osteopathic Medicine at Arkansas State University in Jonesboro, Arkansas. Recent years have seen a professional rapprochement between the two groups. DOs have been admitted to full active membership in the American Medical Association since 1969. The AMA has invited a representative of the American Osteopathic Association to sit as a voting member in the AMA legislative body, the house of delegates. In 2006, during the presidency of an osteopathic medical student, the American Medical Student Association (AMSA) adopted a policy regarding the membership rights of osteopathic medical students in their main policy document, the "Preamble, Purposes and Principles." AMSA RECOGNIZES the equality of osteopathic and allopathic medical degrees within the organization and the healthcare community as a whole. As such, DO students shall be entitled to the same opportunities and membership rights as allopathic students. In recent years, the largest MD organization in the US, the American Medical Association, adopted a fee non-discrimination policy discouraging differential pricing based on attendance of an MD or DO medical school. In 2006, calls for an investigation into the existence of differential fees charged for visiting DO and MD medical students at American medical schools were brought to the American Medical Association. After an internal investigation into the fee structure for visiting DO and MD medical students at MD medical schools, it was found that one institution of the 102 surveyed charged different fees for DO and MD students. The house of delegates of the American Medical Association adopted resolution 809, I-05 in 2007. Our AMA, in collaboration with the American Osteopathic Association, discourages discrimination against medical students by institutions and programs based on osteopathic or allopathic training. In the United States, laws regulating physician licenses are governed by the states. Between 1901 and 1989, osteopathic physicians lobbied state legislatures to pass laws giving those with a DO degree the same legal privilege to practice medicine as those with an MD degree. In many states, the debate was long and protracted. Both the AOA and the AMA were heavily involved in influencing the legislative process. The first state to pass such a law was California in 1901, the last was Nebraska in 1989. According to Harrison's Principles of Internal Medicine, "the training, practice, credentialing, licensure, and reimbursement of osteopathic physicians is virtually indistinguishable from those of (MD) physicians, with 4 years of osteopathic medical school followed by specialty and subspecialty training and [board] certification." DO-granting US medical schools have curricula similar to those of MD-granting schools. Generally, the first two years are classroom-based, while the third and fourth years consist of clinical rotations through the major specialties of medicine. Some schools of Osteopathic Medicine have been criticized by the osteopathic community for relying too heavily on clinical rotations with private practitioners, who may not be able to provide sufficient instruction to the rotating student. Other DO-granting and MD-granting schools place their students in hospital-based clinical rotations where the attending physicians are faculty of the school, and who have a clear duty to teach medical students while treating patients. Sources of the 24,012 medical school graduates entering US physician training programs in 2004. Upon graduation, most osteopathic medical physicians pursue residency training programs. Depending on state licensing laws, osteopathic medical physicians may also complete a one-year rotating internship at a hospital approved by the American Osteopathic Association (AOA). Osteopathic physicians may apply to residency programs accredited by either the AOA or the Accreditation Council for Graduate Medical Education (ACGME). Currently, osteopathic physicians participate in more ACGME programs than in programs approved by the American Osteopathic Association (AOA). By June 30, 2020, all AOA residencies will also be required to have ACGME accreditation, and the AOA will cease accreditation activities. Osteopathic manipulative treatment (OMT) involves palpation and manipulation of bones, muscles, joints, and fasciae. Within the osteopathic medical curriculum, manipulative treatment is taught as an adjunctive measure to other biomedical interventions for a number of disorders and diseases. However, a 2001 survey of osteopathic physicians found that more than 50% of the respondents used OMT on less than 5% of their patients. The survey follows many indicators that osteopathic physicians have become more like MD physicians in every respect —few perform OMT, and most prescribe medications or suggest surgery as the first line of treatment. The American Osteopathic Association has made an effort in recent years to support scientific inquiry into the effectiveness of osteopathic manipulation as well as to encourage osteopathic physicians to consistently offer manipulative treatments to their patients. However, the number of osteopathic physicians who report consistently prescribing and performing manipulative treatment has been falling steadily. Medical historian and sociologist Norman Gevitz cites poor educational quarters and few full-time OMT instructors as major factors for the decreasing interest of medical students in OMT. He describes problems with "the quality, breadth, nature, and orientation of OMM instruction," and he claims that the teaching of osteopathic medicine has not changed sufficiently over the years to meet the intellectual and practical needs of students. At the same time, recent studies show an increasingly positive attitude of patients and physicians (MD and DO) towards the use of manual therapy as a valid, safe and effective treatment modality. One survey, published in the Journal of Continuing Medical Education, found that a majority of physicians (81%) and patients (76%) felt that manual manipulation (MM) was safe, and over half (56% of physicians and 59% of patients) felt that manipulation should be available in the primary care setting. Although less than half (40%) of the physicians reported any educational exposure to MM and less than one-quarter (20%) have administered MM in their practice, most (71%) respondents endorsed desiring more instruction in MM. Another small study examined the interest and ability of MD residents in learning osteopathic principles and skills, including OMT. It showed that after a 1-month elective rotation, the MD residents responded favorably to the experience. In 1998, a New York Times article described the increasing numbers, public awareness, and mainstreaming of osteopathic medical physicians, illustrating an increasingly cooperative climate between the DO and MD professions. Elsewhere, he has remarked that osteopathic manipulative medicine (OMT) "can be an aid to the physician in fostering a relationship with the patient." Each country has different requirements and procedures for licensing or registering osteopathic physicians and osteopaths. The only osteopathic practitioners that the US Department of Education recognizes as physicians are graduates of osteopathic medical colleges in the United States. Therefore, osteopaths who have trained outside the United States are not eligible for medical licensure in the United States. On the other hand, US-trained DOs are currently able to practice in 45 countries with full medical rights and in several others with restricted rights. The Bureau on International Osteopathic Medical Education and Affairs (BIOMEA) is an independent board of the American Osteopathic Association. The BIOMEA monitors the licensing and registration practices of physicians in countries outside of the United States and advances the recognition of American-trained DOs. Towards this end, the BIOMEA works with international health organizations like the World Health Organization (WHO), the Pan American Health Organization (PAHO) as well as other groups. The procedure by which countries consider granting physician licensure to foreigners varies widely. For US-trained physicians, the ability to qualify for "unlimited practice rights" also varies according to one's degree, MD or DO. Many countries recognize US-trained MDs as applicants for licensure, granting successful applicants "unlimited" practice rights. The American Osteopathic Association has lobbied the governments of other countries to recognize US-trained DOs similarly to their MD counterparts, with some success. In over 65 countries, US-trained DOs have unlimited practice rights. In 2005, after one year of deliberations, the General Medical Council announced that US-trained DOs will be accepted for full medical practice rights in the United Kingdom. According to Josh Kerr of the AOA, "some countries don’t understand the differences in training between an osteopathic physician and an osteopath." The American Medical Student Association strongly advocates for US-trained DO international practice rights "equal to that" of MD-qualified physicians. Osteopathic physicians have historically entered primary care fields at a higher rate than their MD counterparts. Some osteopathic organizations make claims to a greater emphasis on the importance of primary care within osteopathic medicine. However, the proportion of osteopathic students choosing primary care fields, like that of their MD peers, is declining. Currently, only one in five osteopathic medical students enters a family medicine residency (the largest primary care field). In 2004, only 32% of osteopathic seniors planned careers in any primary care field; this percentage was down from a peak in 1996 of more than 50%. Traditional osteopathic medicine, specifically OMT, has been criticized for many techniques such as cranial and cranio-sacral manipulation. A study performed in the early 2000s questioned the therapeutic utility of osteopathic manipulative treatment modalities. Also, New York University health information website claims that "it is difficult to properly ascertain the effectiveness of a hands-on therapy like OMT." Another area of criticism has been the relative lack of research and lesser emphasis on scientific inquiry at DO schools in comparison with MD schools. The inability to institutionalize research, particularly clinical research, at osteopathic institutions has, over the years, weakened the acculturation, socialization, and distinctive beliefs and practices of osteopathic students and graduates. If osteopathy has become the functional equivalent of allopathy [meaning the MD profession], what is the justification for its continued existence? And if there is value in therapy that is uniquely osteopathic, why should its use be limited to osteopaths? As the number of osteopathic schools has increased, the debate over distinctiveness has often seen the leadership of the American Osteopathic Association at odds with the community of osteopathic physicians. within the osteopathic community, the growth is drawing attention to the identity crisis faced by [the profession]. While osteopathic leaders emphasize osteopaths' unique identity, many osteopaths would rather not draw attention to their uniqueness. 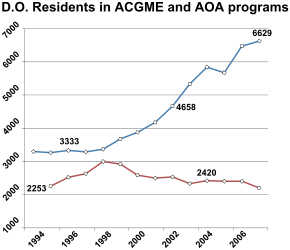 DO schools are currently expanding their class sizes much more quickly than are their MD counterparts. Unlike MD colleges, where it is widely known that academic faculty members—fearing dilution of quality as well as the prospect of an increased teaching workload—constitute a powerful inhibiting force to expand the class size, osteopathic faculty at private osteopathic schools have traditionally had little or no input on such matters. Instead, these decisions are almost exclusively the responsibility of college administrators and their boards of trustees, who look at such expansion from an entrepreneurial as well as an educational perspective. Osteopathic medical schools can keep the cost of student body expansion relatively low compared with that of MD institutions. Although the standards of the Commission on Osteopathic College Accreditation ensure that there will be enough desks and lab spaces to accommodate all new students, they do not mandate that an osteopathic college must bear the expense of maintaining a high full-time-faculty:student ratio. The president of the American Association of Colleges of Osteopathic Medicine commented on the current climate of crisis within the profession. The simultaneous movement away from osteopathic medicine’s traditionally separate training and practice systems, when coupled with its rapid growth, has created a sense of crisis as to its future. The rapid rate of growth has raised questions as to the availability of clinical and basic science faculty and clinical resources to accommodate the increasing load of students. ^ a b c Meyer CT, Price A (1 April 1993). "Osteopathic medicine: a call for reform" (Free full text). The Journal of the American Osteopathic Association. 93 (4): 473–485. doi:10.7556/jaoa.1993.93.4.473. PMID 8267703. ^ a b Patrick Wu; Jonathan Siu (2012). "A Brief Guide to Osteopathic Medicine For Students, By Students" (PDF). American Association of Colleges of Osteopathic Medicine. Retrieved 20 August 2013. ^ Lloyd, Janice (18 August 2009). "Doctor shortage looms as primary care loses its pull". USA Today. Retrieved 8 September 2009. ^ a b c Shannon SC, Teitelbaum HS (June 2009). "The status and future of osteopathic medical education in the United States". Academic Medicine. 84 (6): 707–711. doi:10.1097/ACM.0b013e3181a43be8. PMID 19474542. ^ a b Gevitz N (2009). "The transformation of osteopathic medical education". Acad Med. 84 (6): 701–6. doi:10.1097/ACM.0b013e3181a4049e. PMID 19474540. ^ a b Cohen JJ (Jun 2009). "The separate osteopathic medical education pathway: isn't it time we got our acts together? Counterpoint". Academic Medicine. 84 (6): 696. doi:10.1097/ACM.0b013e3181a3ddaa. PMID 19474536. ^ a b "The Difference Between U.S.-Trained Osteopathic Physicians and Osteopaths Trained Abroad". AACOM. Retrieved August 21, 2016. ^ a b Dennis L. Kasper, Eugene Braunwald, Anthony S. Fauci, Stephen L. Hauser, Dan L. Longo, J. Larry Jameson, and Kurt J. Isselbacher, Eds.Chapter 10. Complementary and Alternative Medicine Archived 2013-12-24 at the Wayback Machine Harrison's Principles of Internal Medicine, 16th Ed. 2005. McGraw-Hill. ^ Osteopathicmedicine. Archived 2007-04-15 at the Wayback Machine Intelihealth.com. accessed Dec 2007. ^ DiGiovanna, Eileen L.; Schiowitz, Stanley; Dowling, Dennis J. (2004). An Osteopathic Approach to Diagnosis and Treatment (3 ed.). Lippincott Williams & Wilkins. ISBN 978-0-7817-4293-1. ^ Chen C, Mullan F (Jun 2009). "The separate osteopathic medical education pathway: uniquely addressing national needs. Point". Academic Medicine. 84 (6): 695. doi:10.1097/ACM.0b013e3181a3dd28. PMID 19474535. ^ Gevitz N (Mar 1997). "'Visible and recognized': osteopathic invisibility syndrome and the two percent solution". The Journal of the American Osteopathic Association. 97 (3): 168–170. doi:10.7556/jaoa.1997.97.3.168. PMID 9107129. ^ Clark RC (1 January 2000). "Increased awareness of osteopathic medicine is essential to the profession's survival" (Free full text). The Journal of the American Osteopathic Association. 100 (1): 6–8. PMID 10693310. ^ Oths, Kathryn S.; Servando Z. Hinojosa. (2004). "Divergences in the evolution of Osteopathy". Healing by Hand: Manual Medicine and Bonesetting in Global Perspective. Rowman Altamira. pp. 67–68. ISBN 978-0-7591-0393-1. ^ Guide for Reporting on Osteopathic Medicine. Archived 2013-05-14 at the Wayback Machine American Osteopathic Association website. Accessed 17 May 2012. ^ a b c Cohen, Jordan.A Word from the President: "Filling the Workforce Gap." AAMC Reporter: April 2005. ^ "U.S. Colleges of Osteopathic Medicine". ^ Salsberg E, Grover A (September 2006). "Physician workforce shortages: implications and issues for academic health centers and policymakers". Academic Medicine. 81 (9): 782–787. doi:10.1097/00001888-200609000-00003. PMID 16936479. ^ AOA Annual Statistics 2016 U.S. Colleges of Osteopathic Medicine. American Association of Colleges of Osteopathic Medicine. January 2016. ^ "U.S. Colleges of Osteopathic Medicine". Aacom.org. Retrieved 2012-06-21. ^ a b 2006 Annual Statistical Report on Osteopathic Medical Education American Association of Colleges of Osteopathic Medicine. Feb 2007. ^ Licciardone JC (2003). "Awareness and use of osteopathic physicians in the United States: Results of the Second Osteopathic Survey of Health Care in America (OSTEOSURV-II)". The Journal of the American Osteopathic Association. 103 (6): 281–289. PMID 12834101. ^ Licciardone JC (7 January 2007). "A comparison of patient visits to osteopathic and allopathic general and family medicine physicians: results from the National Ambulatory Medical Care Survey, 2003–2004". Osteopathic Medicine and Primary Care. 1: 2. doi:10.1186/1750-4732-1-2. PMC 1805772. PMID 17371578. ^ a b c d Gevitz N (Mar 2006). "Center or periphery? The future of osteopathic principles and practices" (Free full text). The Journal of the American Osteopathic Association. 106 (3): 121–129. PMID 16585378. ^ a b c d e Zuger, Abigail (February 17, 1998). "Scorned No More, Osteopathy Is on the Rise". The New York Times. ^ "About Osteopathic Medicine". American Osteopathic Association. Archived from the original on 6 September 2012. Retrieved 30 August 2007. ^ Still AT.The Philosophy and Mechanical Principles of Osteopathy. Kansas City, Mo: Hudson-Kimberly Pub Co; 1902:9–20,185,210,270. Version 2.0. Inter Linea Web site. Accessed January 23, 2006. ^ Hansen GP (1 March 2006). "Beyond OMT: time for a new chapter in osteopathic medicine?" (Free full text). The Journal of the American Osteopathic Association. 106 (3): 114–116. PMID 16585374. ^ Chapter 34: Complementary and Alternative Medicine. Goldman: Cecil Textbook of Medicine, 22nd ed. Saunders. 2004. ^ a b Gevitz N (1 May 1998). "The sword and the scalpel--the osteopathic 'war' to enter the Military Medical Corps: 1916-1966" (Free full text). The Journal of the American Osteopathic Association. 98 (5): 279–286. PMID 9615560. ^ Ober KP (15 January 1997). "The pre-Flexnerian reports: Mark Twain's criticism of medicine in the United States". Annals of Internal Medicine. 126 (2): 157–163. doi:10.7326/0003-4819-126-2-199701150-00012. PMID 9005751. ^ "Notable DOs". Kansas City University of Medicine and Biosciences. Retrieved Aug 15, 2015. ^ a b c Howell JD (1999). "The paradox of osteopathy". N. Engl. J. Med. 341 (19): 1465–8. doi:10.1056/NEJM199911043411910. PMID 10547412. ^ a b Gevitz, Norman (2004). The DO's: osteopathic medicine in America. Baltimore, Maryland: Johns Hopkins University Press. ISBN 978-0-8018-7833-6. ^ Crum JF (Jan 1975). "The saga of osteopathy in California". The Western Journal of Medicine. 122 (1): 87–90. PMC 1130289. PMID 1089010. ^ Kathy Robertson (March 23, 2012). "Part of cure for doctor shortage: Osteopaths". Sacramento Business Journal. Retrieved June 5, 2012. ^ Brotherton SE, Rockey PH, Etzel SI (2005). "US graduate medical education, 2004-2005: trends in primary care specialties". JAMA. 294 (9): 1075–82. doi:10.1001/jama.294.9.1075. PMID 16145028. ^ a b Tulgan H, DeMarco WJ, Pugnaire MP, Buser BR (May 2004). "Joint clinical clerkships for osteopathic and allopathic medical students: New England's experience". The Journal of the American Osteopathic Association. 104 (5): 212–214. PMID 15176520. ^ a b Principles Regarding Osteopathic Medicine. [permanent dead link] Preamble, Purposes and Principles. AMSA 2012 HOD Resolutions. Archived 2012-03-21 at the Wayback Machine American Medical Student Association. ^ a b "AMA policy H-295.876" (PDF). Retrieved 2012-11-30. ^ Thomas, Melissa. "Recommendation on Equal Fees for Osteopathic and Allopathic Medical Students" (PDF). Report of the Council on Medical Education (Report 6-A-07). American Medical Association. Retrieved 1 July 2012. ^ Shannon, Stephen C. The Impact of Osteopathic Medicine’s Growth on Physician Workforce in the US Archived 2008-04-11 at the Wayback Machine AACOM. accessed Feb 2007. ^ "Single GME Accreditation System". www.acgme.org. Retrieved 2016-05-24. ^ Johnson SM, Kurtz ME (2001). "Diminished use of osteopathic manipulative treatment and its impact on the uniqueness of the osteopathic profession". Acad Med. 76 (8): 821–8. doi:10.1097/00001888-200108000-00016. PMID 11500286. ^ Gevitz N (Mar 2006). "Center or periphery? The future of osteopathic principles and practices" (Free full text). The Journal of the American Osteopathic Association. 106 (3): 121–129. PMID 16585378. ^ Licciardone J, Gamber R, Cardarelli K (January 2002). "Patient satisfaction and clinical outcomes associated with osteopathic manipulative treatment". The Journal of the American Osteopathic Association. 102 (1): 13–20. PMID 11837337. ^ Stoll ST, Russo DP, Atchison JW (Winter 2003). "Physicians' and patients' attitudes toward manual medicine: implications for continuing medical education". The Journal of Continuing Education in the Health Professions. 23 (1): 13–20. doi:10.1002/chp.1340230104. PMID 12739255. ^ Leiber JD (Nov 2005). "Allopathic family medicine residents can learn osteopathic manipulation techniques in a 1-month elective" (Free full text). Family Medicine. 37 (10): 693–695. PMID 16273444. ^ Cohen, Jordan. "Following in Flexner's Footsteps". American Medical Association. Archived from the original on 23 February 2013. Retrieved 14 July 2012. ^ Notices. Archived 2008-04-11 at the Wayback Machine Federal Register. Vol. 70, No. 190. Oct 3, 2005. ^ "International Practice Rights Map". American Osteopathic Association. Archived from the original on 2016-08-19. Retrieved 2012-07-01. ^ a b "DOs Around the World". American Osteopathic Association. Archived from the original on 6 September 2012. Retrieved 12 June 2013. ^ a b Singer, Allen M. Debt, Plans and Opinions of Osteopathic Medical Students in 2004. American Association of Colleges of Osteopathic Medicine. ^ Cummings M, Dobbs KJ (Jul 2005). "The irony of osteopathic medicine and primary care". Academic Medicine. 80 (7): 702–705. doi:10.1097/00001888-200507000-00017. PMID 15980090. ^ "Osteopathic physicians and the family medicine workforce" (Free full text). American Family Physician. 72 (4): 583. Aug 2005. ISSN 0002-838X. PMID 16127950. ^ Robert, Ward (2002). Foundations for Osteopathic Medicine: The research status of somatic dysfunction (2nd ed.). Philadelphia: Lippincott Williams & Wilkins. pp. 1188–1193. ISBN 978-0781734974. ^ What Is the Scientific Evidence for Osteopathic Manipulation? Archived 2007-11-02 at the Wayback Machine NYU Medical Center. ^ a b Gevitz N (Mar 2001). "Researched and demonstrated: inquiry and infrastructure at osteopathic institutions" (Free full text). The Journal of the American Osteopathic Association. 101 (3): 174–179. PMID 11329813. ^ Kelso A, Townsend A. The status and future of osteopathic research. In: Northup G, ed. Osteopathic Research: Growth and Development. Chicago, Ill: American Osteopathic Association; 1987. ^ Licciardone JC (2007). "Osteopathic research: elephants, enigmas, and evidence". Osteopathic Medicine and Primary Care. 1: 7. doi:10.1186/1750-4732-1-7. PMC 1808471. PMID 17371583. ^ Gevitz N (1 April 1994). "'Parallel and distinctive': the philosophic pathway for reform in osteopathic medical education" (Free full text). The Journal of the American Osteopathic Association. 94 (4): 328–332. doi:10.7556/jaoa.1994.94.4.328. PMID 8027001. ^ Teitelbaum HS, Bunn WE, Brown SA, Burchett AW (October 2003). "Osteopathic medical education: renaissance or rhetoric?". The Journal of the American Osteopathic Association. 103 (10): 489–90. PMID 14620084. Archived from the original on 2016-03-05. ^ Tatum, William O, IV. AOA Needs to Reach Out More. Archived 2008-01-25 at the Wayback Machine J Am Osteopath Assoc. Vol 106 No 8 p442-443. August 2006. ^ Mychaskiw G (May 2006). "Will the last DO turn off the lights?" (Free full text). The Journal of the American Osteopathic Association. 106 (5): 252–253, 302, 253 302–253. PMID 16717365. ^ Steier KJ (1 May 2006). "Time to accept allopathic physicians into AOA-approved residencies?" (Free full text). The Journal of the American Osteopathic Association. 106 (5): 250–252. PMID 16717364. ^ Tosca M (Jun 2006). "Future of osteopathic medicine depends on investing in graduate medical education" (Free full text). The Journal of the American Osteopathic Association. 106 (6): 319. PMID 16790537. ^ Shannon, Stephen C. What Does the Future Hold? Inside Osteopathic Medical Education. Vol 2. No 2. February 1, 2008. p1. ^ Howell, J D Correspondence. N Engl J Med. Volume 342:817–820 Number 11. March 16, 2000. ^ Johnson SM, Kurtz ME (Dec 2002). "Perceptions of philosophic and practice differences between US osteopathic physicians and their allopathic counterparts". Social Science & Medicine. 55 (12): 2141–2148. doi:10.1016/S0277-9536(01)00357-4. PMID 12409127. ^ Licciardone JC (Jan 2007). "A comparison of patient visits to osteopathic and allopathic general and family medicine physicians: results from the National Ambulatory Medical Care Survey, 2003–2004". Osteopathic Medicine and Primary Care. 1: 2–22. doi:10.1186/1750-4732-1-2. PMC 1805772. PMID 17371578.